False idols make for pretty great gods. At least for a little while, anyway. How many times have I looked at my life and felt sure I was depending on God alone. Financial security, body image, ministry success, fear of man–I had worked through each one of these false saviors. But that’s the funny thing about false idols. We don’t always worship them consciously. Instead, they become so enmeshed in our lives that we can’t even recognize our dependence. Financial security doesn’t seem like an idol when you have plenty of money; it’s only when financial security is taken away that you realize how profoundly you depend on it. Then there’s body image. I thought I had a perfectly healthy, biblical view of my body. Then I had a baby. Suddenly I realized just how thoroughly my confidence and worth were wrapped up in my appearance. There was a time when I thought I had more or less dealt with these idols. I was at peace. I was secure. I assumed I was in a good spiritual place. But that peace was an illusion. The soil I was standing on was not spiritual rock. It was sand. And though it had given me a firm foundation for a time, it slowly began to erode. As it did, it revealed the true state of my soul. Over the last few months, God has been working on me. He’s been undoing a lot, and dethroning some long established idols. It’s been painful. It’s also been humbling. And through it all, God has shown me the restlessness of my soul, a soul frantically searching for meaning, worth and purpose, but finding it in all the wrong places. In Genesis 29, Jacob’s wife Leah goes through this exact same process. Leah is a restless woman. She desperately desires her husband’s affection, so she produces child after child trying to earn his love. The name of her first child means “seen,” the second means “heard,” and the third means “attached. ” This is a woman who longs to feel seen, heard, and connected, all the while overlooking the very one who gave her her husband and her sons–the One who sees, the One who hears, the One who is closer than any other. Leah was done. She was finished with the fruitless searching. No longer would she drink from wells that would leave her thirsting for more. From then on she would drink from the source of living water. She would have peace. She would be free. She would be free to worship God. Whenever my spirit feels restless, I’m tempted to make the same mistake as Leah by running to all the wrong things–the pursuit of comfort, an organized home, a perfect appearing life, a successful ministry, a great marriage. I try to find rest and joy in each of these things, and they might even give me joy for awhile. But they will not end my restlessness once and for all. That restlessness I feel, it can only be satisfied in God. None of us will have the peace and joy we crave until we stop searching, stop placing our trust in false idols, and give our all to Him. That is what God has been teaching me, that restlessness isn’t always a “grass is greener” mentality. Sometimes it’s a divine stirring. God is stirring my soul to quit wasting my time on idols that falter, and to throw my whole self into following him. He is calling me to obedience, but He is also calling me to dream. So that’s where I am. It’s still happening. I’m still in process. But that’s where I am. In God’s good timing, I got an e-mail about a week ago from my friend, Jennie Allen. Today her book Restless is being released, and the timing couldn’t be better. She writes, “Your restlessness may very well be a divine invitation to purpose, calling and life.” Oh if that isn’t right where I am! Jennie describes a restlessness that finds its expression in dreams, in revival, in revolution, all for the glory of God. She is, in short, challenging us women to step up. If you sense that restlessness in your own spirit–whether it has driven you to depend on lesser idols, or it has plagued you with the gnawing sense that you aren’t using your gifts for the Kingdom of God–please please check out this book! God is stirring us to something beyond domesticated discipleship, and we will not be satisfied until we respond. Along those lines, I am so excited to do a BOOK GIVEAWAY for you guys! 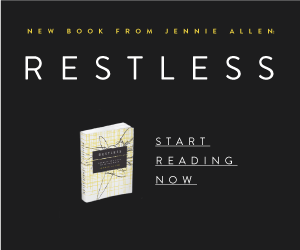 If you leave a comment sharing about your own sense of restlessness–why you’re restless, or what you think God might be telling you through it–I’ll enter your name into a drawing for a copy of Restless. I hope you’ll check out Restless, but more importantly, I hope you’ll take seriously the restlessness within you. What might God have in store that is beyond your wildest imagination? What divine stirring might lie just behind your restless soul? I get ahead of the game sometimes. I get really excited to serve, serve, serve, but this year I feel restless to sit at His feet. I feel restless to walk humbly with Him. I am going to IF Austin and love Jennie. I hope I win the book! My whole life, I’ve striven for worldly success. I got an education and had a successful career right out of grad school. Then, I became a stay-at-home mom. I know that pouring into my home is a ministry and a significant contribution to this world, but I have been the definition of restless nonetheless. I don’t know what God is teaching me yet, but I am confident that he is teaching me. And I don’t want to miss it. I’m feeling restless about the size of our family. After three long years with girls who are practically twins, I find comfort more and more appealing and find it more difficult to open my life to more responsibility. But, he may be calling us to adopt more child(ren). Our home is open to that and I know from our first adoption the blessing is exponential. I.feel.tired. I stay restless. I am still waiting on exactly what God wants me to do in a ministry standpoint. My heart is in Burundi so I am hoping there is something with this country that I can to further His kingdom. I’m done having children. My son is almost 8. I’m in grad school and can’t find a counseling internship because I don’t have experience because I used to be a graphic designer. My husband is beginning a start-up and will be working at home all of the time for the first time since we’ve been married (14 years). I don’t know what to do, but God is the only steady point right now. I’m restless to see women of God live out their art- whatever that may be. And I’m restless to see my place alive in Jesus. Starting “Stuck” with our woman’s group next week. I love Jeannie’s rawness! I know God is calling me, but I don’t really feel “qualified”. That’s where my restlessness comes in! Our group is small, and the woman are always so affirming, but somehow I worry that I fall short. Thinking Jeannie’s book could be a blessing right now! 🙂 Thanks for sharing!! I am restless for marriage…and struggling to see the goodness of God in the waiting. I am always anxious about something. Often not content. I see it in myself, and know I am not resting in God, but struggle with exactly how to fix it. I think my fear of man stops me from doing and saying things that i should say. I hope to break free from this and look forward to reading Restless! I too am restless for peace, if that makes sense. Tired of chasing false idols and just want to spend time focusing on him and his plan for me…not appearances or money or security. Thanks for the thought provoking words…and the giveaway! I am restless for a ministry that is a perfect match for my gifts. God points the way! Wonderful book! Right now I’m pretty restless in dreaming. I have this dream but where to start and where to go and how to know it’s of Him. In restless. . Restless to know and do what’s next. My youngest just moved four sstats away for college and in obedience to God to prove to herself and to HIM that He is more important than her appearance. My middle guy is planning his move halfway across the country in the fall. My husband and I are both restless. And so excited! Ooh! This looks like an awesome read! Can’t wait! Ooh! This looks like an awesome read! Can’t wait! My restlessness often shows up in my marriage relationship. I am on a depression journey and am coming out on the good side – finding my only joy comes from pressing into Jesus and where he will take me from here. I have been feeling restless lately in many aspects of my life…I feel like god is calling our family to something big. It is an exciting time but I am also restless in the waiting. For as long as I can remember, I always wanted to be a mom. 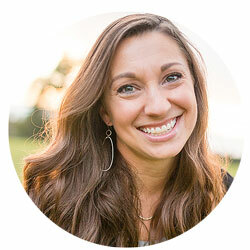 After 5 years of infertility & 3 miscarriages, I questioned God’s plan for my life. If was then that He led us to adoption. We have been blessed with 2 precious boys through adoption, and my husband is content where we are. Sometimes I am content, sometimes I feel like the Lord is not finished adding to our family. When you said you were searching for meaning, worth & purpose, it really hit me. I have been struggling with His purpose for me for quite some time. I have been a stay-at-home mom since we were blessed with our oldest son 8 years ago. This year, I felt the Lord leading me to homeschool our boys. I don’t need to be viewed as ‘worthy’ by the world, I just want to be certain that I’m fulfilling the Lord’s purpose for my life. I’m so excited about this book! I’ve never felt more restless than my current chapter in life-I know that the Lord has given us all gifts and a purpose, but I wonder and question what that looks like for me. Restless post adoption, restless as my husband loses his vision, restless about the future and all that it requires of me. Restless to share my writing but restless to be vulnerable. Restless to find my healing once and for all. But completely at peace with trusting Him. I know God is calling me to more. I have always felt a pull to teach/lead/help women, but we’ve been in ministry so long that any free time that we do have, I just want to hoard. I know I’m called to more but I’m lacking motivation. I need a refreshed heart. I am restless to leave worldly success and things behind and trust only in Jesus and His plan for my life. I just recently read Jennie’s book Anything and have started praying this prayer although it is sometimes scary and hard to do! I want to find purpose and meaning only in Christ, not what the world is telling us to. Restless to get fully on board with Jesus! To put aside the ‘normalcy’ of my Christian life and do what Jesus did—LOVE. Love and serve….be real. Not what everyone expects/wants…but what Jesus wants! I’m so restless for what’s next- the last year felt like so many closing doors and so many dreams meeting a slow death. but there is a slow, small stirring that makes me hope for something new, and that i might get to see God differently. i’m restless for Him to show Himself! Maybe some people get restless and broken-hearted when they’ve done all they can to follow the Lord, when we do what we can to reject our idols and put our faith in Him, but then realize we still don’t encounter the One in whom we place our hope. When we cannot with any honesty say that we have received the peace and joy that others sing lies at the end of that road. Restless that our best, but still feeble, efforts to serve Him generally fail: that prayer for guidance, strength, and faith, encounter a silence which stretches achingly from months, to years, to a decades, restless that faithful Sunday mornings, Wednesday evenings, and nightly reading and prayer, end nevertheless in kids or spouses who reject God. Restless that, maybe physical and mental illness pop-up and don’t respond to prayer. When we read so many of others’ eloquent and inspiring dreams and hopes and plans, and realize that our highest goal today is to keep the light of faith alive for today. I am restless in my life because i know God has big dreams for me however my life continues to be a circle of being unemployed, financial problems and being stuck somewhere i dont think God really wants me to be. Tired of being restlessly weighed down. I’ve been a striver all my life…that is until the past few years where I have been in a wilderness season, where I have needed to learn to rely on Him and Him alone. Yes, I admit, there are times where I still tend to want to take back ‘control’, but I am much more aware of when I am doing it…and I will quickly surrender to God’s leading once again. It is a day by day surrendering of my will. When I feel RESTLESS, it is a huge indicator to me to make time to sit at His feet. More than ever…I sense His calling. I know there is something amazing for me on the horizon. I can’t wait to read this book; I’ve been waiting for it to be released!! Restlessness in my soul….”gainfully unemployed with piling bills and no sense of direction nor open doors not to mention my struggle to believe that Lord loves me, is using this for His glory & my good. I have been working through STUCK and have been challenged as well as blessed in this season of struggle. Restless to know Him & His plans for this 55 year old chick. I am restless to find a way to serve my community with others. I can relate to restless. After a recent upheaval in my life, I realized it was God seeking my attention and my full devotion. I’m still a work in progress but I’m more in love with Him than I have ever been. I’d love to read Restless and see what else I can learn on this journey to resting in Him. I’m feeling restless as a father and a husband. I hear so many voices telling me what I am supposed to be doing “as a man” but it didn’t feel like it fits with what I see from Jesus. I guess I am restless for clarity in God’s purpose for me. I let fear win. I want freedom to win. I get all inspired – have creative ideas…then I don’t do them. I want to step-out bodly. Regardless. Restless – could also be impatience & anxiety. I know I have anxiety and our daughters are plagued with it by society. I am impatient to find out what God has in store for me that I can break out of my restless shell and make a true difference. Tonight Is had a viarety of blogs open to read & my 9 year old saw a link for Compassion and connected to it while I was making dinner…without my realizing she started searching through the children and starting asking questions…finally saying “mom this is THE ONE” – All she cared about was helping THIS child because he was waiting for a sponsor for over a year. There was no question in my mind. THIS is our child! That child as of this evening is part of our family and I can’t wait! Through the eyes of babes…I wish I would see more like that daily and give and want to give with all my heart always….that is what I am restless for! oh, I love that insight into Leah’s story. Then she stopped… There are so many things in my life this could be true about. I just need to stop. Rest in God. Thank you so much for that word today. I’m really excited you’re highlighting Jennie Allen’s new book. I recently came across her blog and am loving what she writes. Right now, I am restless in waiting for the next step in my life. I’m in a weird state of transition and am trying to figure out what God’s trying to teach me through it all. I think I am Restless because I have really been longing to draw nearer to him…. to walk more closely with Him, but I am resisting it…mostly due to FEAR of what He may be calling me to. Your words and Jennie’s seem to be echoing how I feel. I sense God has big changes for our family as we more intentionally pursue missions. I am restless, always seeking what I believe lies in the future and not appreciating the here and now blessings. I would love to read Jennie’s new book. I love reading your blog Sharon! It’s always so thought provoking. I have grown increasingly restless over the past couple of years since I became a stay-at-home mom. I love my kids and I love spending my days with them but I feel like I want/need more. I am restless to walk into my calling. I’ve always had an idea of what my calling would be, but it has become much cleared in recent weeks. In an attempt to define my life; I feel like I have been reading the dictionary backwards- I search scripture, books and blogs looking at the definitions trying to see which words fit. Shame, rage, depression… All of those words work, but RESTLESS seems to encompass all of the already exhisting ways I see myself. I forget that this earth is not my home, I’m so uncomfortable. I can’t get out of this skin that feels too small on me- I’m bursting for the spiritual body that God called me to. I have been restless for years. I have been confusing progress and motivation with sheer busyness. Trying to keep my life busy so I feel like I’m accomplishing something. The truth is that can only be filled by the Lord, and it makes me restless when I chase after anything else. I am restless in my ministry life because I crave and wants so much, I am restless in my financial security because I constantly worry being the single mother of three children, I am restless in finding my own self worth and value. Through this restlessness, I think God is trying to tell me and show me that He is peace. To have me seek Him and see how he takes that restlessness out of my life and replaces it with true work of the kingdom, with sheer happiness in what I’m doing, in being able to take my talents and time and treasures to the next level to serve others. In this season of restlessness, He is begging me, urging me, desperately seeking for me to look to Him for peace and calmness. And that is exactly what I intend to do this year! Having a copy of this book would be such a blessing on that journey, and it would be an honor to be chosen to receive it! Thanks for this post, Sharon. I resonate so much with God’s gracious, but painful, revealing of the darkness still in my heart. I find my restlessness is rooted in not finding Christ sufficient, almost a belittlement of the cross. In the gospel, we find the story of our restlessness being satisfied in Christ. My restlessness has to do with broken dreams and blurred callings and wanting to live my life as God intends it. Wow!!!!! Thank you for all these amazing responses!! I wish I could give a free copy of Restless to each and every one of you. I drew 5 names, so a hearty congratulations to Suzanne, Mark, Starr, Suzanne G., and Kirsten Evensen! To everyone else, thank you SO much for sharing your heart–God is clearly moving and stirring among you, so I hope you’ll check out Jennie’s new book. And if you didn’t win this time, I’ll be doing another book giveaway in just a couple weeks, so tune back in for that! I feel like this was the perfect post for me to read today! I feel restless in what I’m currently doing at college right now: About to graduate with my bachelor’s and applied to graduate school, deciding whether or not to stay at my job of three years, and if I would like to continue into a relationship or not. I also have not been seeking Him entirely, especially subconsciously worshiping false idols. I am going to have to check out this book! Thank you for writing this! Thank God I came across this post. It is what I needed and prayers have been heard. I am convinced that I am experiencing divine dissatisfaction in most of areas in my life. As a result, I’m usually the one whose awake all times of the night dwelling on, thinking about how certain things could be better or a whole lot worse, but praise the Lord anyway. Give Him some with me to speak healing words to my soul. It can only heal with facing the true condition of my soul. Fear has been the reason why I have continually ignore the outcry of my spiritual man.